Dear fellows, I've been asked many times on the slope regarding the making of this BL motor. Especially on the winding method. Below is a link that tells. 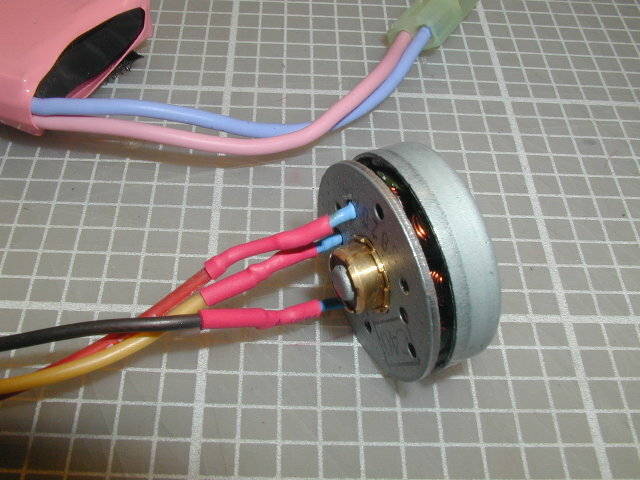 The diameter of my CD-ROM motor is larger than others, that's why the gaps between the magnets are large. Yes, the shaft is not fixed to the outrunner bell, however, I found out that the shaft is tightly coupled to the bell when the bell turns in high speed and all the torque are coupled to the shaft that is turning the pop - at least I can not hold the shaft by my fingers when it turns, it's ok for now. I will fit a pop to check the speed it has tonight. The wire I used is not as thick as yours, this is the thickiest wire I can get hold of and is left-over stuff from my electronic hobby project twenty years ago! By the way, if you can help me to get thicker wire and also another set of magnets, that will be good and I will make another motor with small diameter and hopefully higher speed and higher torque. 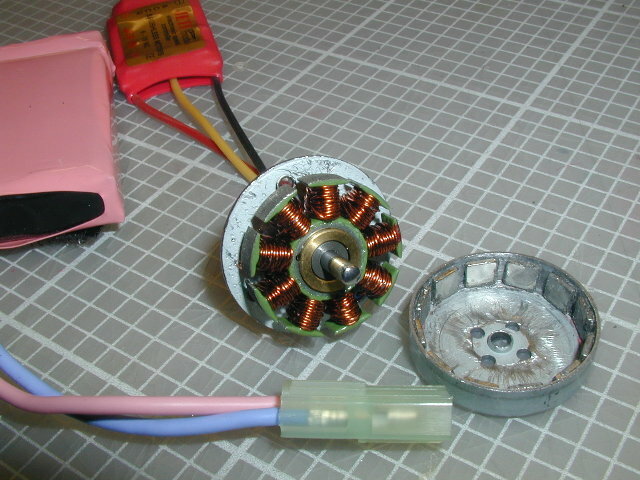 I tested my homemade brushless motor again last night with load. When a 13" pop was installed, I found that the motor will start to shake a lot and will automatically cut off up to half throttle. However, with a smaller pop of 6" it can go to full throttle with speed and the trust it's generated is promising. The shaking started with some kinds of small vibration first and then developed into full interruption of spin. It seems to me that the speed control (Jeti) does not handle the motor properly in high loading. Perhaps this is due to the spacing of the magnets which is not uniform or the gaps are too large. Any suggestion of the cause? 13" prop is seems too big for this small BL. The interrupption of spin might be "misfire". Your red colour JETI cannot set the timing, I can borrow my blue one to you for test COZ it can set to hard timing. BTY, does your BL hot when using a 6" prop? The motor was a bit hot when it was driving a 6" prop with full throttle but it is not as hot as such that you can't touch it with your finger. I think it's ok. I will check the Jeti speed control tonight to see whether I can program it with hard timing. I do have another Jeti SC (blue one), so I will try this if the red one cannot be programmed. Does your BL better now? A big news today!! Hong Kong has a lady who could make her homemade BL with 350g of static thrust!! Which is using an 8x4 prop, 9V at 10A, 0.4mm wire with 16 turns. Guess who is she?..........My wife Pauline. You should be proud of your achievement! Not only because you can make one BL motor yourself but can also train a women to do so. This is a mission that I think imposible! My tiger wife would never do this for me, in fact, I have to build my motor secretly away from her sight, otherwise I would be in trouble! My red Jeti controller can not be programmed to hard timing mode, so I changed a speed controller (blue one, Advance 18P), but still the motor would stop at half throttle even it was drived in hard timming mode. I guess probably the loading of 13" prop is too high. I will show it to you once I see you in the flying site. I've removed the bell from the motor, but have I got to remove the stator from the printed circuit board for rewinding of the wire ? How can it be done! Should I force it out ? from my very limited experience, I opine that the stator is better removed from the PCB. Otherwise, it would be so difficult for the winding. Each motor has their unique design. Therefore, no hard and fast rule to remove it. Just try. By the way, the best method to remove the old magnet from the bell is burning. call me direct if you encounter problem. Regards. Good work done. Coz it is quite difficult to wind 20 turns with .5 wire. I could test your motor for you, as I have full set of gears to read the rpm, v, a and thrust etc..... keep up the effort. cheers. Good news. I tested your motor this morning, it turns. I used GWS 4025 prop, it turns at 19260 rpm. Takes 9v at 7A, render 160g static thrust. A very good result or first attempt. Should you replace the stock magnets, I guess it can run with a 6" prop. Which BL controler would you suggest for this type of motor? I share the same view that Phoenix 10 is quite good choice for this type of motor. I order one from aircraft world (Japan Web), and am waiting its arrival. I also heard that some controller will interfere the receiver, but last time with my mini bee, I put the controller underneath the receiver and found no problem at all. I used Jeti at that plane. But for safety reason, you better adhere to George's advice. The Phoenix Micro 10 Brushless seems to be what I need. It have motor braking as an additional feature. However, does it require the USB programmer "CC-PHNX-LINK" to enable the brake function?